My Creative Existence: Cards for new arrivals! 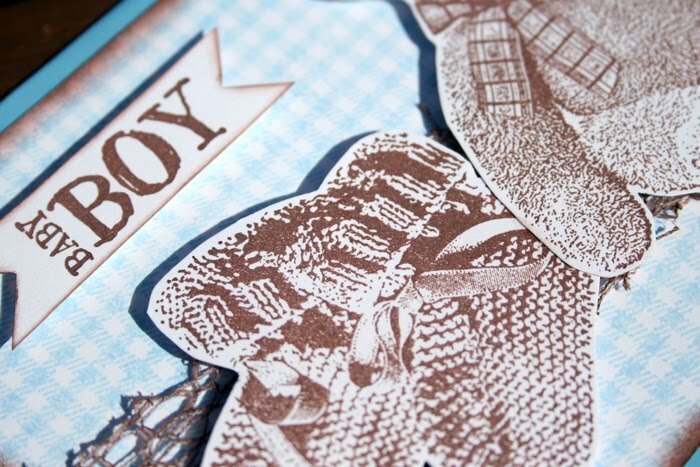 The plaid background stamp is just perfect for baby cards - and as you can see, stamping it in different colours instantly gives you a different look for baby girl, baby boy, or more neutral colours. 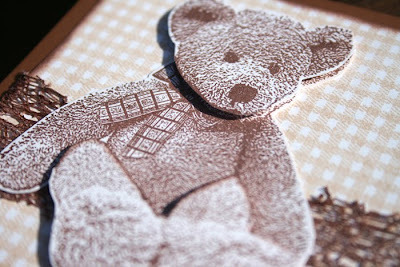 The bears, booties, pram, and greetings have all been stamped using the same colour brown ink - the look of the card has only been changed by the colour of the background stamp and the colour of the card base. Just goes to show how versatile your stamp sets can be! Don't you just LOVE that bear? It's sooooo cute, and stamps up really well. On the brown card, I have cut out a 2nd head and 2nd pair of legs, and adhered it over the first with foam mounting tape, which gives it great dimension and really makes the bear stand out! I did the same on the pink card, but just the head. The blue and yellow card images are just single layered, mounted with foam tape. You can see photos of each individual card, and read more about how I made these cards on the Darkroom Door blog here.